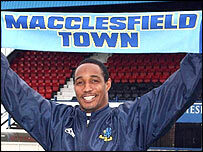 Macclesfield Town have unveiled Paul Ince as their new player-manager on an initial 14-month contract. 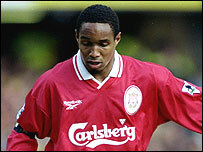 The former England and Manchester United midfielder succeeds Brian Horton, who was sacked on 1 October. Macclesfield are without a win this season and are currently seven points adrift at the bottom of League Two. "It's a huge challenge because of the situation the club's in, but I wouldn't have taken it on if I didn't think we could get out of it," said Ince. "I wouldn't say it's a gamble - it's a challenge and I never shirked a challenge as a footballer. "It was a gamble to leave Manchester United for Inter Milan, so you do take chances, but that's the way I am. I'm excited about it. "It's important that you learn what it's like in the lower leagues and that's what I intend to do. "You're putting yourself up there to be shot at and that's what I like about it. "Football's given me a great life and I'd hate to walk away and not try being a manager and now I've got the chance." Ince spoke at length with ex-Wolves and England boss Glenn Hoddle last week about management and acknowledges the toughest part of his new job will be getting to know League Two. His only experience of the division was a brief spell playing at Swindon earlier this season and his first task at Macclesfield will be bringing in an experienced number two. "The hardest thing for me is getting to know all the players," he said. "Someone was saying to me the other day about 'so and so' and I had to say 'who? ', because I didn't know who he was. "It's important the number two is the right one who has been in this league and knows all the players." Ince is frustrated he will have to watch the Silkmen battle relegation without being able to influence matters on the pitch until January. Having been registered with Swindon when the transfer window closed in August, he must wait until it re-opens to don his playing boots again. "It is disappointing. With it being my last year, I want to play as much as I can," said Ince, who will be in charge for the visit of Mansfield at Moss Rose on Saturday. "The wife's been nagging me for the last few months, saying 'get out of the house'. "I didn't envisage it'd happen this quickly. She's happy so I'm happy and I'm looking forward to it."